Although electronic music was nothing new, this is the track that really kick-started the whole electro sound. 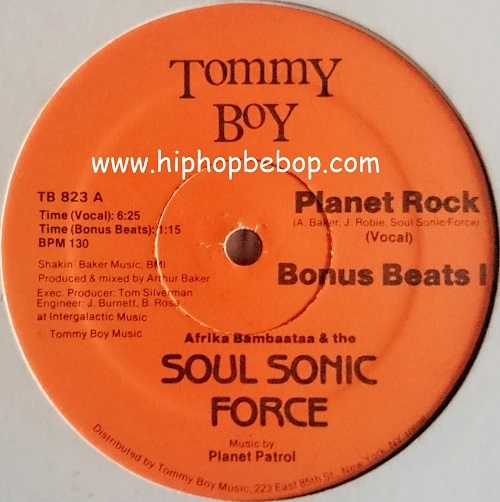 The music is by labelmates Planet Patrol who re-used it for their own release “Play At Your Own Risk” and uses elements of Kraftwerk’s “Numbers” and “Trans Europe Express”. 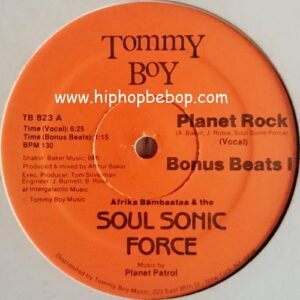 It features Bambaataa and Jazzy Jay plus the vocals of Mr. Biggs, Pow Wow and MC G.L.O.B.E. and was produced by Arthur Baker & John Robie. There are quite a few variations to the label, a selection of which are pictured below plus an abundance of remixes. All the standard pressings and reissues have the same track listing. The first pressing was a plain orange label with just text and had 2 slight variations. It was followed by a green label which was the first to feature the traditional Tommy Boy silhouette dancers and was followed by varying shades of blue. It was even released on a purple vinyl 7″ in 1982 plus reissued by Get On Down in 2014 on glow in the dark green vinyl for Record Store Day. Also worthy of note is the Adam’s Family Mix on Fee Bee Records listed as just Soul Sonic Force.